In large bowl place beef, pork, applesauce, egg, bread crumbs, onion soup mix, salt, pepper and 2 tbsp. mustard. Mix well to thoroughly combine ingredients. 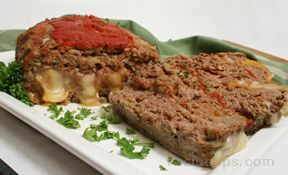 In shallow roasting pan, pat meat mixture evenly into loaf approx 8 x 4 x 2 inches. Bake for 30 min. In small bowl, stir together remaining tbsp. of mustard with brown sugar. 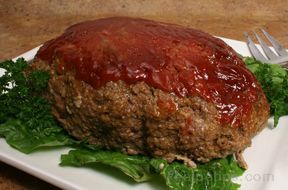 Spread evenly on top of meatloaf. 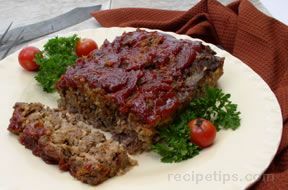 Bake for another 30 min, until meatloaf is nicely browned and fully cooked. Pour pan drippings into saucepan and skim fat from the top of drippings. Stir in gravy and heat, stirring until hot.